Hey ladies and gents, it's REM back with another tutorial. 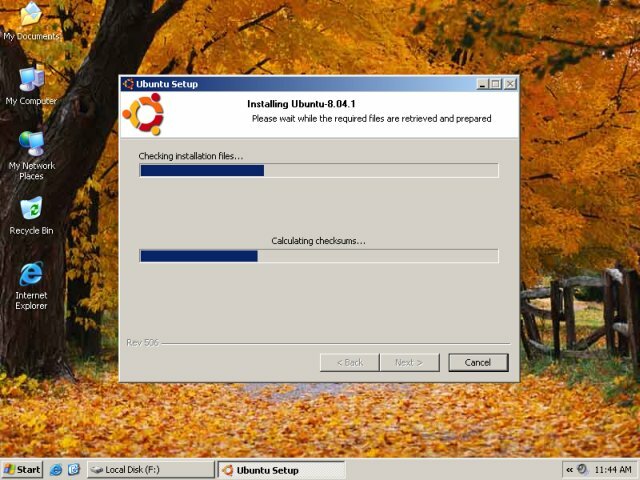 Today, we are gonna learn how to install Ubuntu on your machine without the need to partition or anything! It's really quite simple, and it takes about 5 clicks to install, literally! Ubuntu is an operating system which is a Linux distro, a version of Linux that is very user-friendly and can be great for beginners who are just introducing themselves to the world of Linux. 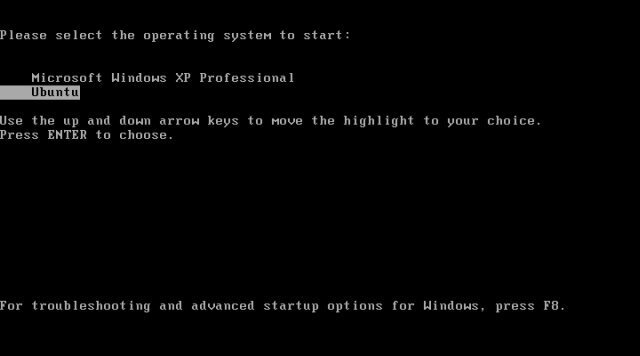 Bare in mind that Linux is not Windows, and it will take some time before you figure out that it does not behave like a Windows. Wubi is an Ubuntu installer and acts just like any application would, it stores the files of Ubuntu onto your C: hard drive or wherever you have specified so you don't need to partition your hard drive or do anything special. Now, after a the front page, you will be met with some settings that you need to set, like how much space are you going to allocate for Ubuntu. (5GB minimum. Personally, I have mine set to 18GBs) Set your distro to be Ubuntu, whatever language you want and enter your user name and password that you will use in Ubuntu, then press next. Wubi will then start to download the .iso file for Ubuntu. You can speed this process up if you have already downloaded the .iso file beforehand from http://www.ubuntulin...ubuntu/download, and putting the .iso file in the same folder as Wubi. Wubi will then check the files are correct, and after some time (2-5 minutes) will ask you to reboot. 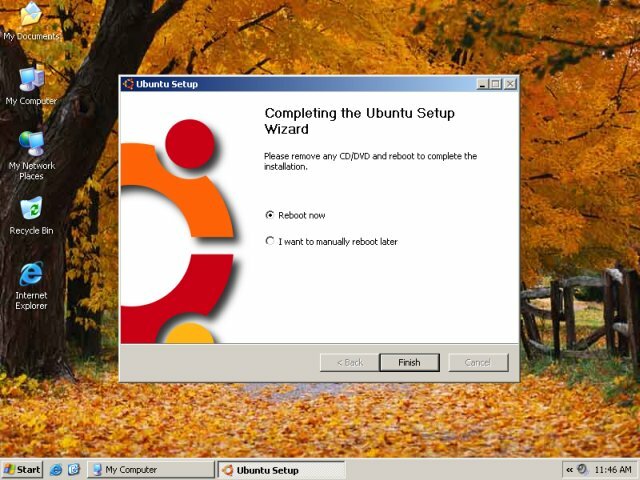 Once you go into Ubuntu, it will begin installing, this process usually takes about 10 minutes only, then you will reboot again. 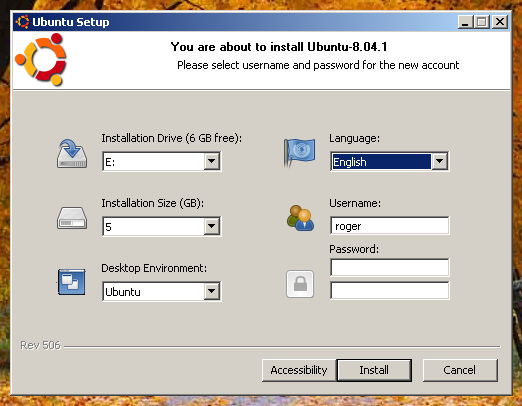 (Same thing as before, you have to select Ubuntu from the BIOS screen) and then login using your user name and password! And Viola! Ubuntu is now installed on your computer. Now you can install applications using the Ubuntu Software Center *How handy is that!? *, surf the internet on your shiny Mozilla Firefox 3.5 (Linux edition of course ) or even create documents using OpenOffice.org (just as powerful and professional as Microsoft Office 2007). The best thing with Ubuntu is there is always an alternative to every program. Don't like Rhythm-box? Install VLC Media Player. Don't like your display manager? Just install another one! The possibilities are endless. You can still access the files on C: folder, they are located at /host. What more could you ask for? And the best thing is, if you ever get sick of Ubuntu (I don't see how), you can just uninstall Wubi from Windows just like any other program you have. Now, I know your excited to try this and are just scratching to give it a go, but I'm an honest man, and since I mentioned the pros, I must mention the cons too. Firstly, Ubuntu installed with Wubi cannot hibernate. It just doesn't let you hibernate. Secondly, it'll be a bit slower than if you installed it on a separate partition. You mostly won't notice this, but statistically, it will be slower than usual. But that's about it. I hope you enjoy your new Ubuntu dual-boot, and I hope that you see the light of Ubuntu and let it shine on your heart. Au Revoir and enjoy! Thanks it was a great tutorial, atleast i got to learn something new. If possible can you post another tutorial on how to install ubuntu without using wubi because i am really looking forward to switch to linux. Personally, I wanna try and properly install linux too. I'll see what I can do. There is an update for you to know, or be aware of...if you would like. I have a question do you have to download the .iso file and put it in the folder or can you let Wubi do that?